PMP Passing Score (Part 1): Is 61% still the passing score for PMP exam? PMP exam passing score has undergone several changes over the years, but old myths refuse to die. I’m a huge fan of the popular science television series, MythBusters, and today I’m going to play the MythBuster and take on 5 popular myths about PMP exam passing score. This article is part of the series on PMP passing score. Apart from the popular myths, we’ll also look at changes to PMP passing score and FAQ on PMP Passing Score in an attempt to educate PMP aspirants about the topic. Update Aug 19, 2017: PMP Exam Result Report is changing. The 3-level domain-wise proficiency rating would be replaced with a 4-level proficiency rating from Aug 28, 2017. Disclaimer: PMP exam scoring criteria is a black box. While I’ve made all effort to provide the most accurate and complete information, I provide no warranty, expressed or implied, as to the accuracy, reliability or completeness of furnished data. Please use this information at your own discretion. This is history and not true anymore. The passing percentage used to be 61% until 2006. Back then, the percentage was clearly specified in the PMP Handbook. In 2005, PMI also published a document “Frequently Asked Questions regarding the new PMP Examination”, in which they clearly mentioned the passing score as 106 out of 175 (about 61%). The FAQ document is not distributed by PMI anymore. But now, PMI does not disclose the exact passing score or percentage anymore. You would not find any official PMI document that specifies a PMP certification pass percentage. You can also confirm this with PMI Customer Care. It’s been several years since PMI implemented the change. Unfortunately, even now many PMP trainers, websites and resources continue to promote 61% as a passing score, and many unsuspecting PMP aspirants continue to go into the exam thinking they need to score 61% to pass. The myth continues to thrive like an “urban legend”. Establishing the Passing Score The passing score for all PMI credential examinations is determined by sound psychometric analysis. PMI uses subject matter experts from across the globe to help establish a point at which each candidate should pass the examination(s) and the examination point of difficulty. Data that show how candidates actually performed is cross referenced with the subject matter experts to ensure that the point of difficulty on each examination is healthy. In sound psychometric analysis system, there is no documented set mark or percentage you must achieve to pass the exam. The minimum mark or pass percentage varies for each exam, and is based on the exam’s difficulty and on all the student’s scores achieved globally. It also means that if you get lots of easy questions on the exam, your pass percentage may be higher compared to the pass percentage if you get tougher questions correct. So one candidate may pass the exam scoring just 55%, and the other may fail despite scoring 65%. This is essentially the same as the previous point. If you get the tough questions correct, you may pass with a lower overall score. So the point is that tougher questions carry higher weightage. Refer to PMP Certification Notes for help with complex project management concepts not explained well in the PMBOK Guide or in other popular PMP Study Guides. The myth floating around goes on to specify the exact minimum percentage for each proficiency level. For example, Proficient = 80% (or above), Moderately Proficient = 61% (or above), and Below Proficient = Below 61%. Interesting, isn’t it? I call this The Kidney Heist of PMP certification. It is pure speculation. If it’s not mentioned in the PMP Handbook, I don’t trust it, no matter what anyone says or writes. In other words, it means that a single “Below Proficient” grade in any domain will shut the doors on you. This isn’t true either. In part 2 of this series, I’ll show you real PMP passing score data (score results) gathered from successful candidates, that proves this wrong. People have scored “Below Proficient” in one or more domains and still passed the exam. 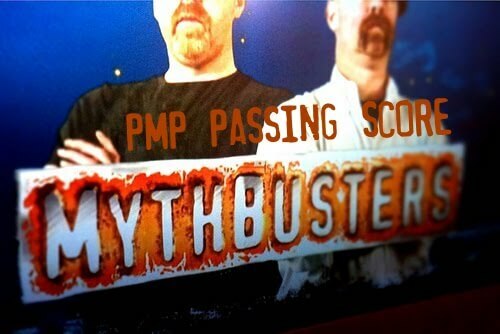 Now that we have busted the myths, let’s look at the key changes to the PMP passing score in a chronological order. It’s important to give you this background so that you can understand the current situation clearly. So, let’s review the changes in a chronological order. In 2004, PMBOK Guide, 3rd Edition was introduced. In July 2005, PMP exam was changed to align with PMBOK Guide, 3rd Edition. At the same time, PMI increased the passing percentage to a staggering 81% (yes, eighty one percent). With the increase in passing percentage, the percentage of candidates clearing the exam in the first attempt dropped dramatically. PMI was quick to react and dropped the passing percentage to a more reasonable 61% (sixty one percent) in Dec 2005. Until 2006, the PMP Handbook clearly specified 61% as the passing score, but thereafter, PMI stopped revealing the exact pass percentage, even though, they continued to provide the domain-wise percentage on the score reports. The next big change occurred at the end of 2007, when PMI changed how diagnostic results were presented in the score reports. Instead of domain-wise percentages, PMI started using global best practices in examination administration by using proficiency levels. So now they provide proficiency levels like Proficient, Moderately Proficient and Below Proficient by domain, instead of a numerical percentage scored in each domain. For Computer-Based Test, you will know the result after several ‘loooong’ seconds upon completion of the exam. You are allowed to pray to your God during this time. In short, you’ll get the result on your screen immediately after you complete the exam. Prometric test center will give you an “official” sealed copy (computer print-out) of your marksheet before you leave the test center. For Paper-Based Test, it will take a few weeks before you get the result. Test result - Pass or Fail. Note: The Score Report does not show your actual score or even percentage score. Yes. You can view your certification status and PMP exam score report online at PMI’s Online Certification System. After you log in with your user ID and password (you need register on that site first if you don’t have an account), you would see your current certification status and a link to the PMP exam score report in the “My PMP” section in the navigation bar on the left. Is there any way to find the percentage score on the PMP Exam? No. PMP Exam score report only indicates the domain-wise proficiency level. There’s absolutely no way to find the actual score. What is the Percentage Equivalent of each Proficiency Level on the PMP Exam? If PMI were to disclose percentage values for each proficiency level, then why would they move away from the old system (of publishing the score in percentages) to the new system (of publishing proficiency levels)? So the short answer is - PMI does NOT disclose the percentage score for each proficiency level (Proficient, Moderately Proficient, Below Proficient). Does proficiency level (or score) matter on the PMP Exam? First of all, PMI doesn’t provide a score for PMP Exams. You only get a domain-wise “Proficiency Level” on the PMP Exam score report. When it comes to PMP exam, a pass is a pass. It doesn’t really matter how comfortably you pass or how narrowly you scrape through. The proficiency level is provided to help you identify your strengths and weaknesses. What is the PMP exam failure rate? There’s no published data on the PMP exam failure rate, but based on my experience and interaction with PMP candidates, I think around 30-40% of the candidates fail the PMP exam on their first attempt. Read about the Top 5 reasons why people fail the PMP exam and be sure to avoid those pitfalls. Now that we have separated facts from fiction, you might ask, what percentage should I really “aim for” while preparing for the PMP exam? I can understand your dilemma and fully empathize with you. The target was clear when PMI used to publish a fixed passing percentage for the exam. But now the situation is a bit murky. You do not know what is a good score on mock exams, what is the right strategy, and when you are ready for the exam. I’ll address these concerns in part 2 of this series. I would also like to hear your stories, things you might have heard or experienced on this subject. Feel free to add your comments and complement this information. Thanks Harwinder for the good article. I have a query, does one need to score at least average in each of the area. I mean, if suppose one score very good in all the process group suppose score very less or say zero in the questions related with (say) professional responsibility, then the person would not get pass? Great question. Believe it or not, I have already got this question covered for Part 2 of this series, where I'll take on the popular myths about PMP Passing Score. I would be posting it soon. The short answer to your question is "No". You can pass the exam even if you score "Below Proficient" in some domains. Check back again soon for a detailed answer in my next post. If you have other questions on this topic, I would be eager to hear from you. Using the 20 years of data collected from the scores on my Benchmark Exams, and the actual scores received by the participants on their PMP over that same period of time, I am able to accurately (+/- 3 points) convert the qualitative scores to quantitative scores, and based on this correlation, I do not have any reason to conclude that PMI has changed the 106/175 or 60.6% passing grade. I believe the reason PMI made this change was because potential employers were asking applicants what their SCORE was on the PMP exam and using that just like grade point averages from the University. Bottom line here- IMPO, PMI has not done the practice of project management any favors in doing this. Keep in mind that the REAL value of the PMP can only be maintained if those who hold it consistently deliver projects on time, within budget, in substantial conformance to the specifications and substantially fulfilling the need for which it was undertaken in the first place. In the 20 or so years I have been doing this kind of training, I have yet to see any credible research supporting the fact that holding a PMP resulted in better project management or that NOT holding one resulted in poorer project management. Sorry folks, but you need to be realistic in exactly what the PMP stands for and represents. Thanks for sharing your insight. You may be right about the passing score, but I look at this differently. I'll put my thoughts in the follow-up articles. Thanks Harwinder for another interesting article..
As per the L-Ls of the folks who cleared the exam, it is reflected that if one is scoring 75/80% or more in the Mock exams like Rita, pmstudy etc, then one can consider him/herself good to go ! Actually after reading this article one may get a bit scared that one can never know inspite of scoring good in the practice exams that he/she is prepared for the exam.. I think I can offer some solid data that might refute at least some of the myths you think you have busted. In our 90 day long, graduate level, blended learning courses, we conduct three benchmark exams. These benchmark exams are administered to all of our students. Which means I have 15+ years of results from our benchmark exams. More importantly, for those years PMI published the actual scores on these students received on their PMP exam. Which means that I have literally thousands of data points which correlate the scores on my benchmark exams to the scores received on the PMP Exam. And based on that database, I am able to predict the score on the PMP Exam +/-3 points based on the results of the Benchmark Exam results. 1) It appears to me that PMI has kept the same passing point of ABOUT 61%, +/- 3 points. (Passing grade range of 58% to 64%. 2) Our 15 year, running average, first attempt pass rate for English as Second Language has been 86%. Since the change over, our pass rate has not changed, and our training materials has only been updated to reflect the relatively minor changes in processes and vocabulary, meaning that PMI has not made the exam more or less difficult. It is substantially the same as what it was before the change. So while much of your Myth Busting analysis is accurate, you to are perpetuating some of the myths that PMI might want us to believe, despite the fact that my numbers prove otherwise. FWIW, on another forum, I have offered to make my data available to a few bonafide researchers to analyze it further. My best advice in closing? CAVEAT EMPTOR!! I must say that this is fantastic information and probably one of the best comments I've received. Even your criticism is a compliment for me. 1. PMP pass percentage is not exactly 61% anymore - you also agreed to it. It could be +/-3 point or +/-5 points, it doesn't matter. Why? I'm going to post my views in part 3 of this series. 2. PMI uses the Modified Angoff technique and the exam passing percentage varies with each exam. Both of us agree on this. 3. Every question doesn't carry equal weightage. You agreed to this. 4. There's no 1:1 relationship between Percentage score and Proficiency level. And how can it be if the passing percentage varies with each exam? 5. One doesn't need to score "Moderately Proficient" in all 6 domains to pass. I have the data to prove this. Thanks for your contribution and being a good mentor for aspiring Project Managers. Maybe it was how you phrased some of your postings? 2) it is now something else. My response was it never was EXACTLY 61%, but around 60.6%, subject to adjustments due to the Modified Angoff method. My second point was that the exam passing score is still 61%, +/-. But the 3 points I spoke of are not from PMI, but the predictive margin of error if you use my database to calculate or predict what your real score was. If people email me privately, pauldgphd@gmail.com, I will send you a simple excel spreadsheet model that you can use to convert your QUALITATIVE score into a numeric or QUANTITATIVE score, with the understanding my excel model is only accurate to +/-3 points. Other than Myth 1, I don't see any significant differences between what I know from experience and what you wrote. But because this is a website where wannabee PMP's come, I feel a professional obligation to counteract the false and misleading "myths" that PMI intentionally or unintentionally have allowed to build up around the PMP. Meaning it is still testing for EXACTLY the same thing it was originally designed to test for..... Basic vocabulary and a few concepts. Glad you enjoy my willingness to speak out against PMI. At one time, I was an extremely loyal foot soldier until the organization stopped reflecting the beliefs and values I hold as a life-long practitioner and advocate. I respect what you said, but I have seen the older copy of PMP Handbook (from 2006 or so) that clearly states 61% as the passing score. If you are suggesting that PMI was not truthful about it then that's a different story. Let me see whether I still have that copy. If I find it, I'll post a link to it so everyone can see it. In my opinion, PMP 'complements' real project management experience, not 'substitutes' it. I don't shy from calling a wrong, a wrong. For example, I agree with you on many aspects like the "dumbing down" of the exam. You and everyone else is welcome to express their opinions and share insights, as long as it provides value to the readers. As PMI has used the Modified Angoff method since the mid 1990's or maybe even before, then their own posting of 61% was not totally correct. And to be accurate, it was 106/175 or 60.6%, BUT to my knowledge, (long discussions with Paul Grace, former Director of Certifications) the actual score varied, based on the MA weighting factor. And I wouldn't be so vocal in speaking out against PMI, except for the fact I believe they are causing more damage than good to my life's work, and as a professional practitioner, I feel morally and ethically obligated to speak out. I visited your website and something that caught my eye and really made me curious was the PMI-REP logo. Can I ask you why your company is a PMI-REP when you do not hold very favorable opinion about PMI? You can ignore this question if you do not want to answer it. Thanks so much for your invaluable contribution to this blog. I'm obliged to add a link to your website http://www.getpmcertified.com to my Blog Roll section. Have a good night and create a great day tomorrow. I guess the missing comments bug is back to haunt Blogger platform. Folks, you might see some of the comments missing temporarily. Yes, Harwinder you're right it is no more no game. I did very good on rit's fast track getting 90% and at PMSTUDY.Com 75% but when I took exam on Dec 15, I got all domains "Moderatly Proficient". I am happy that I passed, but I guessed I get Proficient. Congratulations on passing the exam and thanks for sharing the good news. when is your part 2 up for release? Part 2 was posted a while ago. I just updated the link in the post above. Actually I have planned four parts for this series. I'm still collecting some information for the last two. Really interesting information,which destructed all wrong foundation in my mind. That wrong myths direct me to fault ,and therefore I assessed exam more easier that it really is.So my first exam in September 15th failed,even though I had been assured that will pass. by the way I got 4 moderate and 2 below in ethics and monitoring & control. And now,I am a little bit confused ,how is my actual level. Just I figured out that need more study and NOTHING else. My best advice? Try again in 30 days and just be sure to study more on earned value and anything to do with project controls. As Dr. PDG said, you are not too far from the mark. You can pass the exam even if you score moderately proficient in all 6 domains. Alternatively, if you get Proficient in one high-weightage domain like Planning or Executing, you can still pass by scoring below proficient score in one of the domains. Professional & Social Responsibility domain is a bit strange. Some people find it very easy, while others, very difficult. I got 100% in this domain in my exam. I hope you have gone through this topic in the PMP Handbook. Apart from this, I'll give you a simple tip for the exam - a PM does everything by the book, follows every rule, no matter what. For example, even if your real brother does something wrong, you report him to the authorities, no matter what the circumstances are. Follow this simple rule, and you can many more questions right. Moreover, follow Dr. PDG's advice, and you should be able to ace the exam. Go to the download page and look for the "Weighted Exam Calculation Template" and download it. Also while you are there, you may want to download the recent preliminary research I published which compares the various credentials offered by other professional organizations. I think for many of you, it will be an eye opener when you see where the PMP falls vis a vis other less well known but highly regarded credentials. Enjoy, and my only request is, if you pass these files along, PLEASE give appropriate credit as to the source... I put most of my research on the internet under Creative Commons license and at least I would like to get credit for the work I am doing. I could not download the spreadsheet. It says "You must be logged in to download this file". I didn't see any registration page (or at least it wasn't located in a easy to find spot). Also it would be nice to have a "Contact Us" form so that people can send the feedback directly from your website. This came to 76% according to your spreadsheet, which is pretty much in line with what I had guestimated myself, (75-80). I think this thread shows that people have a need for a quantitative assessment. It's good to know how well one did against other people, but it's not enough. I found many questions poorly written (such as using "they" when referring to the project manager in a scenario) and in at least one case there was a typo - "produce specification" instead of "product specification." I had to read that one several times before I realized what the problem was. The other thing that I don't find very helpful is that the percentage of questions and proficiency scoring are based on process groups while the PMBOK (and the exam prep course that I attended) is arranged by knowlege area. I think this would make it harder to know exactly where you might need extra study. However, I suspect other course providers might teach it differently. Personally, I think that learning by process groups makes more sense than by knowledge area - but I can sort of see why it's organized by knowledge area. FWIW, we have never taught the PMP Exam based on the knowledge areas. It never made any sense to us. You really think you are good? Then go for the AACE or INCOSE credentials.... Those are twice as technically demanding as the PMP. We have a 6 month long, graduate level, blended learning class kicking off in Jakarta after Lebaran on 23 September, then another course in Lagos, Nigeria on October 4-11 and another starting in London, UK on 13-17 October. Hint: Aim for a score of 100% on 3independent sample exams and you will have nothing to worry about on the real exam. I took Rita's exams 6 - 8 times, scoring 54 - 62, then a 69. and passed PMP with 2 belows, 3 moderately, and 1 proficient. If you score 80 on Rita's, you're good to go. One more thing to add: The only area I was Proficient in was Executing, was moderately in 3 others and Below in Closing and Social, and I passed. If you score 80 in practice, you will have no problems. That's an astonishing result - passed with 2 Below Proficient scores ! That goes to show that if you do very well in a high weightage, you can afford to miss out even on two lower weightage ones. Folks, don't forget you can download a free excel spreadsheet model that will convert your qualitative PMP exam score to a QUANTITATIVE (numeric) grade. It is accurate to +-3 points, and to date, I have not heard of any false positives (people who showed they passed using my model but failed the PMP) or false negatives (people who passed the exam who showed they failed using my model) being reported. Finally I was able to download your excel sheet and review it. If I substitute these values, I get a score of 66%. So, our anonymous reader scored somewhere between 63 to 69%. Is that a correct interpretation? If not, please explain how to use it using the same example. Thanks for your continuous support and contribution. Yes, Harwinder...... You have explained EXACTLY how to use the scoring model. does anyone know what percentage of PEOPLE pass it on their first try? fyi: I meant to say I took the PM Fastrack exam 6- 8 times in my comments earlier. Accordingly to my guesstimate, about 60-70%, or roughly 2 in 3. We have a 15 year long, running average first attempt pass rate of 86% for our English as Second Language (ESL) professionals and 99%+ for native/near native speakers of English. We have not, do not, will not "teach to the exam". We believe in teaching "best practices" of project management, and much of what we teach goes well beyond the PMBOK Guide. You made an interesting point about having "English as a second language". Some of my colleagues, who are not native English speakers, told me that sometimes they find it hard just to understand what the question is asking because of one or two words in the question, which they are not familiar with. So if they get even 5 questions wrong because of language problems, that can make all the difference between passing and failing. What are your suggestions to such candidates? I know that PMI offers language aids in 12 languages, but I'm not too sure how they work. Do you have any information how language aids work? Do you advise your students to opt for language aids, if they are not too comfortable in English? As I think you know, I am not a big fan of either PMI or their PMP. I do not believe the PMP should be a quasi TOEFL test, yet that is exactly what it has become. Prior to 2000 or so, PMI used to allow standard English Language dictionaries (i.e. Websters or Oxford) to be used by non-native speakers of English. For whatever reasons, they stopped allowing that which is but one of the reasons I have switched my loyalty from PMI to AACE and INCOSE. Those alternative organizations not only offer credible certifications equal to or more technically sophisticated than what PMI offers, but those organizations are, IMPO, more "user friendly" to ESL professionals, as their certifications are more focused on PROBLEM SOLVING rather than VOCABULARY and look more at COMPETENCY than merely passing written examinations. Unfortunately, until or unless people are willing to stop "following the crowd" and start to perform some due diligence on the credentials they are seeking out, organizations such as PMI will continue to amass hundreds of millions of dollars based on the false promise of what is nothing more than an entry level, vocabulary based credential. I comment you that, although I thought that I was going to pass the test until the last second during it, I failed on my first try. I am thinking to take the exam again in one or two months. You need at least "Moderately Proficient" in all 6 domains to pass the exam. Even if you are one answer short of getting into the "Moderately Proficient" bracket, you'll end up into "Below Proficient". So, it is possible that you could be just one answer short in each of the 3 domains where you scored "Below Proficient". So, don't get disheartened. Sometimes, it's a matter of luck too. Now to recommendations, I need to get some background first. What is your experience level in project management? What kind of training did you undergo to get your 35 contact hours? Which study material did you use? How much preparation did you put in? If you prefer to respond privately, you can send me a note via the Contact Me form. I am a PM Jr. I have one year experience. If you meant that you have a total of 1 year of project management experience, then I appreciate your honesty, but I'm sorry to say that you may have misunderstood the PMP exam eligibility criteria. You need to have at least 3 years of project management experience to apply for PMP certification. So, that's probably the first and most important reason you did not pass. I'll suggest that you look at the CAPM certification for the time being, and when you get the required experience, you can go for PMP again. Feel free to write back, if you have further questions. I meant a full year of experience using that title. I have the required time of experience, I have proof of that, but not using the title of PM. If you would take the time to download the PMP Handbook http://www.pmi.org/PDF/pdc_pmphandbook.pdf , I think many of the questions you are asking here will be answered. Sorry for the misunderstanding. I had no intention to offend you. 2. Don't rush to take the exam again. If you have time (before your 1 year eligibility ends), take time to study thoroughly and let the content sink in. 3. Get another good exam prep book. My personal favorite is Rita Mulcahy's PMP Exam Prep. 4. Try lots and lots of sample questions. If you can afford, invest in a commercial sample exam set too. 5. Take note of the questions you got incorrect "on the first attempt" specially the situational questions. Analyze them thoroughly and understand where your thought process went wrong. Bridge the gap. 6. Read the PMBOK Guide very thoroughly. It can help you answer many more questions correctly. 7. Try to recall your exam experience and write your own lessons learned. Try to fill in the gaps. 8. Read some lessons learned posts from successful candidates and see if you missed something. 9. Learn the PMIisms. Rita's book is a good source for them. You need to answer the exam questions in the PMI-way to pass. 10. Try to read some supplementary material. I have tons on them on http://tips.deepfriedbrainproject.com site. What do you think about the book "Head First PMP"? I request you to post your question on the "Books" page (link available in the top menu) to keep the comments relevant to the topic. I'll post a complete review of the Head First PMP within this week. P.S. : I'll delete the comment from this page after 7 days. I am currently studying for the PMP. In reading this and many other sites, I am finding the ~61% score to be the benchmark. Regardless of it being 61% or 64% or even 70%, it seems a little low, no? Maybe it is harder than I am giving it credit for, but it is a low sounding percentage. PMI has had a history of "dumbing down" the PMP Exam. The PMP has, IMPO, become a grossly over-rated knowledge based test, which at best, measures an understanding of PMI specific vocabulary and nothing more. Unfortunately, what was originally designed to be a benchmark to see if people were knowledgeable enough to be able to move from working in a functional organization to being able to serve on project teams and not be totally lost, has been distorted into being a measure of ones ability to be a competent project manager, which is totally false. The worst of it is, PMI is unwilling to stand up and make this clarification, which to me, amounts to false and misleading advertising at best and blatant fraud at worst. Just in Jan 2010, 6300+ people added PMP suffix to their name. Guessing from that rate, passing the exam isn't all that difficult. I have been doing technical team lead work on IT projects, and just took the PMP exam because it opens more doors with prospective clients. I read the PMBOK, bought an online course, studied for a week, and passed with 4 P and 2 MP. From my point of view, the designation is not such a big deal and the exam is not that hard. Anyone who has the requisite education and experience to sit the exam should be able to pass with flying colors because the material is just a bit of new terminology and formalized knowledge on top of what you should already know and practise. The thousands of dollars charged by some companies for PMP preparation courses are a big scam IMO. I just passed my exam with all MP scores. I studied for 4 days, one time PMBOK, one time Rita and tested myself on simulator and scored 79.9% on full 4 hrs 200 qs test. Thought I cam ready and finally cleared it, though I would have liked some P's. As far as exam was concerned it was ok, only I was surprised by too many questions about Quality & Risk tools & techniques, which unfortunately I could not memorize and since I m also not familiar with these tools, I just guessed the answers for these questions incorrectly. Congratulations. Passing the exam with 4 days of prep is an incredible feat. Thanks for sharing your experience. I'm sorry to hear that. It's indeed strange that you had the same set of questions on the exam on both occasions. On one side, it sounds like a bad thing, but the other side of it means that you had known (at least some of) the questions beforehand, and had a better chance of cracking them. It suggests that your study approach didn't change after the first attempt. I suggest that you review the approach with someone who has already passed the exam, before you go for another attempt. Take time to prepare and not rush for the 3rd attempt. Don't give up. Note: You have 1 year from the date of your application approval to pass the exam (in max. 3 attempts). You can drop me a note (through the Contact Me form) if you want to discuss further. Thanks for sharing your experience, and good luck. Go for AACE or INCOSE? I think I'll have a rest first. I suggest that you take the matter offline with Dr. PDG, and help me keep the discussion thread relevant to the topic. You can contact Dr. PDG directly from his website. I'll delete the comment after couple days. I'll appreciate your understanding. Your competition in China, Indonesia and India are already looking beyond the PMP, which, IMPO, has largely been commoditized. I read your email. First of all, my unconditional apologies for not making you feel welcomed on this blog. Congratulations on passing the exam. I have been moderating the comments through my phone for the last few days. Due to the limitations of the Blogger platform, it's very difficult to post and respond to comments through the phone. Somehow, even before I had a chance to congratulate you, Dr. PDG and you had responded with follow-up comments. Generally, I do not delete any comments, unless they are spam. But, I do want to keep the conversation on target. As long as the comments are on PMI / PMP, positive or negative, I encourage them. So, please forgive me if I offended you. I encourage you to post your lessons learned and share your experience. In future, if you do go for AACE or other certifications, please come back and share your thoughts on their merits and demerits compared to PMI certifications. Interesting posts, and I agree with your assessment/attitude 100%. I passed my PMP yesterday - and came out of the exam feeling more angry than anything else. d) poorly written. I would love to have the opportunity to debate some of the questions based on nuances in the language used. I seriously question how seriously they've formed their questions (pun intended). Is it supposed to be a test of knowledge or a test of tricks? All said, I will need some time to reflect whether the process was worth the cost. I would do a cost/benefit analysis, but PMI didn't teach me how to do it, just what it is. Some of your Malaysian colleagues just passed their AACE exams in the last couple of weeks and there are 3 or 4 of them starting our next class in Jakarta after Lebaran. And I will PROMISE you, that when you earn your AACE credentials, you will have every reason to be justly proud of having done so. Email me pauldgphd@gmail.com to find out more information. Congratulations on passing the exam, and thanks for sharing your comments. I agree with you on many aspects. If you view PMP as a knowledge based certification, it's not bad, but as a competency based certification, it is far from it. Also, PMI is not doing it's due diligence in many areas. If there are good alternatives, they will get their due share sooner or later. Anyway, I'm sorry to hear about your experience, but appreciate your comments. It will give the readers a 'neutral' comparison of the two programs. Who knows, one day I may have an AACE Blog too !! Hi Again Harwinder. This same AACE certification class we just finished resulted in two Singaporeans (and one Thai) getting their AACE credentials as well. We conduct it both face to face and distance learning mode (Blended learning) and it is POSSIBLE (but not recommended) that people can take it distance learning mode only. And not, I cannot and will not offer "free" seats, but I will be more than happy to put you in contact with recent graduates, most of whom already have their PMP and to quote one of them just recently "AACE wins, hands down". If you email me privately, pauldgphd@gmail.com, or my boss, Yani Suratman (who is in S'pore right now if you want to meet her) yanis@ptmchttp://-apmx.com will provide you with the information you need. Now, this is a BRUTALLY tough course..... But based on the excellent work you've published here, I have no question you (Harwinder) could make it. But ultimately, the best is to introduce you to people who hold BOTH the PMP and the AACE credentials and let THEM tell you which one they are most proud of holding. If you want to catch up with Yani, she will only be in S'pore until Wednesday night. She is on her Blackberry, so you can either email her, yanis@ptmchttp://-apmx.com or phone her, +6281-6187-3992. Thanks for the reply. Oh, and as Dr. PDG pointed out, good job on the website. You're right - it's a general test of PMBOK knowledge without regard to compentency. They should print this in bold letters at the top of the certificate. However I'm still angry that they made me study their model of communication - i.e., Transmit-Encode-Decode-Receive and noise, but then proceeded to write convoluted sentences that are difficult to understand! IMHO, PMI needs to look at its own belly button for awhile. Any advice for getting these views to PMI? It's a shame that such a good concept and great idea appears to being corrupted. Perhaps someone should start a blog on this topic alone in hopes of creating more awareness. 2.2.6 - We uphold this Code and hold each other accountable to it. 2.3.3 - We bring violations of this Code to the appropriate body..
5.2.1 - We earnestly seek to understand the truth. I guess the last one is the kicker. Rest assured- you are not alone in your disdain for PMI. With 100 million USD in the bank, how the organization gets away calling themselves a "not for profit" is a question that never ceases to amaze me. There is little you can do to fight it, other than express your dissatisfaction, then "vote with your feet" and join other organizations. As I have said i previous postings, AACE, INCOSE and AIPM all have credible credentials. I may now be spamming my own blog :) but I want to highlight that Dr. PDG's Weighted Score Calculation template may have a feel good factor, but it has some limitations. Dr. PDG can correct me on these points. 1. Even if you score 0% on the PMP exam, the spreadsheet will give you a score of 50%. Similarly, even if you score 100% on the exam, the spreadsheet will never give you a score of more than 80%. 2. The spreadsheet is really simple, and there's no magic as such. It assigns a percentage score to your proficiency level. For example, P = 80%, MP = 65%, and BP = 50%. These percentages are calculated from statistical analysis, which is explained above by Dr. PDG. If you know the domain-wise distribution of exam questions (which is published in the PMP Handbook), you can do the same calculations using a simple calculator. 3. PMI's proficiency levels are based on a band of (percentage) scores. For example if you score above 75% in a domain, PMI would say you are proficient. But it won't tell you how proficient you are. A person with 76% and another with 100% are put into the same bucket - Proficient. The spreadsheet cannot take care of this problem. Essentially, yes..... As I think I explained some time back, my model (available for anyone to download http://www.build-project-management-competency.com/download-page/) only measures a BAND of +/- 3 standard deviations above or below the mean. Which means that it has proven accurate to +/- 3 points (sigma = ~1) meaning (as I hope all of you do) that it covers ~98% of those who take their PMP Exam. Are their outliers? Yes, of course, but the data I have for the years that PMI published the actual grade, the lowest score anyone who took our course got was a 48% and the highest anyone scored was a 92%. Which means that my model ignores the two tails of the distribution for no other reason that my 17 years of data indicates that at least for those who take our training, NEARLY 100% consistently fall between 50 to 80 %. Bottom line- does my model work for EVERYONE? No it does not. It does not work for those who score very high or very low. But again, since the "new" system went into place, we have maybe trained 1,000 people and no one has scored all below proficient nor has anyone scored all proficient. Hope that makes sense to everyone? PS: Harwinder, on point #2, you cannot calculate the score only by using the the data PMI provides to you. In order to be able to calculate what PMI's real passing number is, would be if you had the actually passing grades from when PMI published that information. Because we record that in our records and track it (we still do, btw) we have sufficient data to know that PMI has not changed the passing point from 61.6%. Because we also created standardized benchmark exams of our own, and administer 3 of them to each class, we can very easily correlate the relative difficulty of our exams to the actual score on previous PMP exams and the accuracy of our Benchmark Exam #3 correlates almost perfectly since the changeover. If and when PMI changes the ratio of questions or changes the passing point, we will have to modify our model, of course. But used as a benchmark, we will be able to tell if PMI dumbs the PMP exam down much further than they already have or not. Thanks for your responses. I've read all your comments above and will answer them one by one. Unfortunately, Blogger doesn't allow threaded comments. So, we have to bear with what's available. I want to challenge the model on behalf of my blog readers. Please do NOT take it in the wrong sense. a. The model is based on scores of "your students". The benchmarking and correlations were established for students who took your course. You mentioned that for "your students", the lowest score was 48%. But you'll agree that not everyone takes your course for the PMP exam, and not all courses are created equal. I'm pretty sure that there are much lower scores on the PMP exam than 48%. On the same lines, the +/-3 point accuracy is applicable to your students, but it may not be applicable to others. So, I believe that the model "fits" your students more than others. b. You had previously mentioned that the mean score in your model is 66.1% with a standard deviation of 2.65%. That makes anyone scoring below 58% (-3 sigma) and above 74% (+3 sigma) as an outlier. If we step backward and try to understand who needs this information most, isn't it the people who fail the exam? The person who fails the exam really wants to know the "margin" by which he/she fell short. This person is very likely to score below 58% and be an outlier in your model. So, in my view, this model won't help "most" people who fail the exam. c. The Benchmarks and the (+/- 3 point) accuracy were established during the days when PMI used to provide the percentage scores. After they moved to the proficiency based system, how do you validate the accuracy of the benchmark and hence the model? What if PMI has changed the exam content or the difficulty level in last couple years? The +/-3 point accuracy may well have changed to +/-5 or 6. I admit that it may be a reasonable to assume that the exam hasn't changed, but it's still an assumption. d. I didn't understand how you got the figure of 98%. What does that figure indicate? On #2, I think you might have misinterpreted my comment. I meant that the domain-wise distribution is publicly available through PMI. So, if we use "your model" and get the percentage for each proficiency level, we can calculate the score using an ordinary calculator. The excel sheet doesn't have any embedded intelligence as such. It's the percentages from the model, which matter. And it doesn't matter whether the model was created using only our students. The qualitative values have been turned into quantitative values, which are valid within +/-3 sigma. (We had two last week who passed and one who failed and their QUANTITATIVE scores matched almost perfectly. The two who passed did so with scores calculated using our model between 62% and 65% and the second passed between 65% and 68%, while the guy who failed scored between 58% and 61%. So here is a perfect example of samples which exactly bracketed PMI's old passing score of 61.6%. Oh, and the 2.65% is for English as Second Language (ESL) participants. For native/near native speakers we have a 99.9% first attempt pass rate with a sigma of <1%. Bottom line. If you are willing to accept that for 98% of people who take the PMP exam our scoring model works and for the outliers beyond +/- 3 sigma our model does NOT work, I think you will agonize less over it. Explained another way, IF (and it has never happened) someone scored all "Proficient" we would say to them that they scored 80% or better on their PMP exam. Likewise, for anyone who score all "Below Proficient" (which also has never happened to us) we could say accurately that they scored 50% or less on their PMP exam. In between +/- 3 sigma, we can tell them their score to any degree of reliability they desire. Again, don't agonize over the model. It is to give a "reasonably accurate" estimate of the actual grade and the model has been validated by both our students and others who are not our students. You may wonder why I post on this blog, seeing I tend to be so negative about PMI and the PMP? First, Harwinder has impressed me with the quality of the work he has produced here. I see a LOT of garbage published, some of which is downright WRONG. So his blog is one of the very best. Secondly, project management is my life's work. I am not an "accidental" project manager. It was what I wanted to be when I grew up 40+ years ago and it is STILL what I want to be when I grow old(er). So when I tell you the PMP is nothing more than an entry level credential and that IF you consider yourself to be a "professional practitioner" you need to look to INCOSE or AACE, I am not doing this to make money (I have enough of that). The reason I am doing it is because of my committment to project management and the great pleasure I get out of passing along what I have learned over the years to people like you. Put it this way- what I teach you is exactly the same as what I teach to my kids and grandkids. Thanks a lot for the confidence you've shown in my abilities. That "free seat" comment was supposed to be a joke. I'll definitely pay the full fee if I take your course. I'll get in touch with you offline on that. Let me say a BIG "thank you". Your comments are the BEST compliment I've EVER received. I wish I could frame it and hang it on my office wall. I really appreciate the contribution you have made and are making to the profession. However, there's one question I always wanted to ask you. You are the biggest critic of PMI that I know of. Then why does your company endorse PMI certifications and provide PMI certification courses? Why is it a PMI Registered Education Provider? Thanks again. I'll remember your compliments forever. Fair enough question, Harwinder about why we complain so much about PMI and the PMP yet still teach courses. First, we have NEVER, do not now, nor will we ever in the future "teach to the exams" be it the PMP other PMI credentials or any of the AACE certifications. So we teach "best practices" in project management which, if you actually UNDERSTAND them, will easily prepare you to sit for ANY of the PMI or AACE certifications. The reason we have been able to stay in business for so long (this is our 15th year based here in Jakarta, (with collaborative offices in Singapore, Johannesburg, Lagos, London and Anchorage Alaska) is because the graduates of our program are in fact competent practitioners. Which is really what our client companies want. We provide competency development first and foremost, which, oh by the way, is more than adequate for people to pass their PMP Exam. Our price does not include membership in PMI nor does it include the PMP Exam fee. Those decisions are between the client and PMI. This way, I can feel good that the people we turn out actually know what they are doing, and are not just good at passing exams. Explained another way, our commitment is to the practice of project management and NOT to creating more PMP's. Yes, you addressed my question well. I'm quite sure that I saw the PMI-REP logo on your site until about 6 months ago, but it's no longer there. Correct me if I'm wrong. I also remember posting a similar question to you at that time (on one of the other blog posts), but don't recall getting an answer. Anyway, my comment has been addressed, and I'll be surely looking into your recommendations. Thanks, and have a great week ahead! Harwinder, thank you for your welcome and also thank you for this informative and interesting blog. I wish I had come across this site sooner but unfortunately I did not find it until after I had sat for the PMP exam. I was trying to figure out the percentage equivalents of the proficiency scores when I came across this discussion and Dr. PDGs spreadsheet. While I realize that any such model cannot be completely accurate, it gave me exactly what I was looking for. My scores were “Proficient” for Planning, Executing, and Monitoring and “Moderately Proficient” for the other three areas. Using the spreadsheet, it came to 76%, which was pretty much confirmed my WAG of 75 – 80%. Prior to finding this tool, I was intending to try and calculate the score using the same approach – i.e., by multiplying the number of questions in each category by a percentage equivalent for P and MP, but I did not know what percentage values to use. The spreadsheet provided the basis. I’m not sure what the psychology is behind the need to quantify the results but there definitely is the need. I had also used another tool using 85%, 50%, and 25% values for each question based on your confidence in the answer and arrived at estimates between 75% and 78%. On another topic also addressed by several people in this thread, I agree that the PMP exam doesn’t test project management skills but just knowledge of PMBOK language. But what really gets me is that it’s not even a test of your understanding of PMBOK concepts – it’s just a memory test. For most questions, you cannot arrive at the answers using reasoning or experience. You just have to remember the PMBOK definition of the specific term and whether it’s a process or an input, output, or tool/technique associated with a process. For example, most people are familiar with “ground rules” but why is it a tool for Develop Project Team but not for Manage Project Team? And why are organizational process assets considered inputs, not tools? I didn’t find the test quite as difficult as I expected, mainly because the questions were not as wordy as the practice tests I had taken. The formula-based questions were especially easy as long as you knew the formulas, which I did. I don’t think any of them even required calculation. However, there were a number of questions that asked about inputs to a process and although I had memorized a lot of the T/Ts and outputs, I ran out of time before I got to inputs (which were the hardest for me to remember). Another question that gave me trouble was one that asked what was considered a successful project. I was stuck between “Project is delivered on schedule and within budget” and “Customer approves the project deliverables.” I really couldn’t choose between the two because I would have thought both would need to be true to be successful. What’s the “correct” answer? I didn’t find the test quite as difficult as I expected, mainly because the questions were not as wordy as the practice tests I had taken. The formula-based questions were especially easy as long as you knew the formulas, which I did. I don’t think any of them even required calculation. However, there were a number of questions that asked about inputs to a process and although I had memorized a lot of the T/Ts and outputs, I ran out of time before I got to inputs (which were the hardest for me to remember). You didn't mention whether or not you studied the PMBOK Guide itself? Rita's book alone is not enough. You have to read over the PMBOK Guide 3-4 times as well. Be sure to hurry before the end of August, as the exam will be changing and HOPEFULLY, PMI will be making it more difficult, but I doubt it. Also, have you been to http://www.PMHUB.net yet? If not, be sure to go there as there are lots of "lessons learned" that should help you. I'm sorry to hear that. I guess it could be bad luck. What was your proficiency levels in various domains? As Dr. PDG said, focus on the PMBOK Guide and read lessons learned (click on the "Lesson" button in the top menu bar of this page). Attempt lots of sample questions (click on the "Exam" button at the top). You could also try BrainBOK to get your head around ITTOs. And I hope you know that you have time until Aug 30 to take the exam in the current format. After that it's going to change. And I've also heard that if you take the exam from Aug 31, you'll have to wait 4-6 weeks to get your result. This will be the case for the first 2-3 months where PMI will evaluate the results and adjust the exam content, difficulty etc. based on how the candidates perform. I wish you good luck and hope that you'll come back here with the good news pretty soon. I took the test 16 of september. A total of 5 areas. I scored Moderatly Proficient in 3 and Proficient in 2. I failed and don't have a clue what went wrong. All questions where made in Rita's book with an average of 78% before. Does anybody know what it takes to pass? I'm really sorry to hear about your result. It's shocking to hear that you failed despite scoring 2P and 3MP. It is however possible that PMI has changed the definition of P, MP and BP. For example, maybe now they require everyone to score P in every domain. I'm not sure yet because you are only the second person that I've come across who has got the result on the new format. If I was in your situation, I would follow the PMI Appeals Procedure (given in the PMP Handbook) and challenge the result. Let me know if you decide to take that route, and the outcome. Don't lose hope. Good luck. My name is Johan as the anonymous who didn't pass September the 16th. I have spoken to my teacher at the preparation course and he hadn't heard about failing with 3MP and the rest as P. I've sent a letter to PMI, but honestly what can be done? The test result was sent to me 3 weeks after the exam so you don't get it right away. Perhaps the process is manual and the decision is made in an other way than before? I think it's a mistake. So, let's hope for the best. I'll try to check the proficiency levels with other folks who are passing the exam on the new format. If I find something, I'll post it here. You can subscribe to the comments on this thread, if you haven't already done so, so that you get updates via email. PMI changed the exam on August 1st and just a GUESS, but I have a suspicion they have made it more difficult to pass. Based on the latest PMP Exam specifications, it APPEARS as though PMI is moving the PMP towards being a competency based credential, similiar to their PgMP. I hope they make the exam more difficult, but how can 2P + 3MP = Fail? If their new criteria is Proficient in all 5 domains, then they should just have 2 levels - "Proficient" and "Not Proficient". I'm checking with another person who got his result today and passed. We'll find out soon. As noted to Johan, I don't know for certain, but based on commercial intelligence I gather, it surely looks like PMI is responding to complaints about the PMP having been "dumbed down" and while I doubt they will make any announcement, based on what I have seen and comments from "people who are in the know", I think you may very well see a higher passing grade being required and more difficult questions. I also suspect you will start to see some sort of more robust verification of the work experience. Thanks for sharing your insight. All those are steps in the right direction. So I hope it turns out to be true. Again, just a GUESS but previously, the passing point was 106/175 or ~62%. What I suspect PMI may have done is to RAISE the passing score.....??? IF that is the case, you may need to get "Proficient" in 4 out of 5 or maybe even "Proficient" in all 5. Again, this is nothing more than speculation on my part, but it makes sense given other pieces of information I have been receiving. I received your previous comments but did not approve them because you had too many specifics in there. I suggest that you rephrase and re-post that message. I can understand if they change the testscore. But why doesn't PMI announce that? I'll take the preperation course. They are telling me that with your knowledge and the testresults shown there should be no problem to pass the test. Almost everyone passes after this course. They are not aware of that changes have been made to make questions harder and that it is a higher passing score. I'll just say that if this is the case I think I've been cheated. I can't understand if they change the passing score, why keep the BP, MP and P. It tells you nothing, like in my case: You are above average but you fail anyway. Strange. I hate to appear to be a cranky old man, but most of you are totally missing the point. Passing the exam means almost NOTHING if you are not capable and at least marginally competent professional practitioners. Bottom line- your focus should NOT be on passing the exam but on becoming the best possible project manager you can be, and if you do the latter, the former will become very easy. Please check the comments in that link. Looks like no one knows what is going with PMI or what their grading scale is. Ha! I have mine scheduled on the 17th. I am not sure if I even want to take this exam any more at least at this point of time. Thanks for sharing that information with us. Here's the clickable link: http://www.pmzilla.com/date-pmp-22sep11 . We need a few more results to really make sense of the situation. As per the new exam, I got 1 Proficient and 4 moderately proficient and still managed to pass it. Thanks for all the articles on your blog. They were really helpful to understand the concepts. Thanks for sharing your result on my request. I really appreciate that. I'm glad you found the blog useful. Hopefully, that'll encourage me to start updating it again. Good luck and savor the success. I would like to provide another data point. I am having trouble understanding this result as Initiating is the second lowest weight domain with 13% in the latest distribution. I'm sorry to hear about your result. In the previous system, you would have passed with that score because the P in M&C would have compensated for the BP in Initiating. Actually you might also have a case to file an appeal with PMI. If I were you, I would try my luck. P.S. Please avoid posting your message as "Anonymous" because things can get really confusing if there are too many Anonymous posters. At least put a pseudo-name, if not your real name. Hello! I'm Riccardo from Italy. I failed with: 4ModProf+1Prof in Monitoring&controlling. According to the previous system,I woluld have failed? I took the test September 15th and was notified that I failed. I was "proficient" in Planning and moderately proficient in the other four areas. So I failed with 1 "P" and 4 "MP," while Amit passed with the same numbers. I really wish PMI would come out and explain how the new scoring works. My opinion is that you may have "passed" with the previous system. But, there are folks with 2Ps and 3MPs, who've also failed. I feel bad hearing such reports from folks who were brave enough to take on the new exam, and patient enough to wait 4-6 weeks for the results, but ultimately had to go through the misery of failing the exam despite doing reasonably well. I have no problem with PMI making the exam more difficult (in fact, I think they should). But what I don't understand is the feedback that they are giving you with those proficiency levels, which, as it's turning out, mean almost nothing. I just hope that these are system errors, and all of you, who've at least scored MP in all domains, will get an email from PMI that you've PASSED, and your previous results were incorrect. Otherwise, I think you should file an appeal against the result and at least give yourself a chance. Thank you Harwinder for your support. I wrote to the costumer care of PMI looking for some explanation....I spoke with my teacher and he has never seen exams failed with noone below proficient. I'm considering also your advice to file an appeal. P.S. I saw your Results survey and there are a lot of similar exam failed. I don't know how to give sense to that. There's a link at the top of the form for the summary of responses. I'll find a more prominent location on the blog to post the survey form, very soon. I have just received a letter from the PMI. My previous fail is now a pass (4 PM, 1 P). Apparently there has been an error in the scoring and they have rechecked all the exam results under the new process. Hope that everyone else with similar scores has received the same mail. Thank you Harwinder for your support! WOW, this is an awesome news. Congratulations!!! "I just hope that these are system errors...you'll get an email from PMI that you've PASSED...". But I cannot quite comprehend how "PMI - the World's Leading Professional Association of Project Management" can make such glaring errors. Is all the knowledge of good project management only in books? I feel they should issue an apology and compensate you guys for all the agony they've caused you in the past few days. Anyway, I'm really happy for you and hope that more good news will pour in soon. I also received the "we (excuse me, their vendor) screwed up and you passed" e-mail. Given the problems I've heard about the last time PMI changed the exam, I'm surprised that they made the same mistake again. theThis is probably NOT a good sign.... This is what PMI did the last time they changed the exam. Just a guess but I would doubt it was an accident (especially if there are multiple changes from fail to pass) but a sign that PMI has dropped the passing point. Whether they made the exam more difficult is another story. The point here was that people were failing despite scoring Ps or MPs across all domains. That just didn't make sense. As you said, time will tell whether the exam or passing percentage has really changed or not. Yepp I recieved the mail today - Passed! Over all I'm happy. I have to cancel my test 31 of okt. Refund I hope... I've studied day and night since friday and my wife cancelled her travel to Scottland this week to take care of the kids. We both realize that I wouldn't become normal until I pass the test. Now she will have to work doubble next week. But I'll do anything to support her. I hope you will recieve the same mail! Johan - congratulations! You must be a relieved man today. Enjoy your time with your family. "We apologize for the concern and trouble this incorrect exam report may have caused you. An error in exam processing occurred because exams were originally scored by an erroneous scoring process so that some candidates' pass/fail result was calculated incorrectly". It's very strange, but it was nonsense to fail with noone BP. And it was nonsense that my collegue had the same result as me and he passed. Maybe PMI calculated the score twice and they made confusion when they decided to maintain the same general percentage of successful exams as before change? Anyway...thank you for all Harwinder! In this mess... you (and this site) have been the only light. At least trying to find an explanation. Everywere else people are just shaking their heads and feeling a bit sorry for me. PMP failed utterly in their own project management? Irony of life :). Looks like they have to revisit their quality control and also update their lessons learned ..:). Congrats to all those who went on this roller coaster ride. And Harwinder - I am taking the exam on Oct 17th ;). And please tell me that I WILL PASS. Say it with me - "Joy will pass". Looks like things you say do come true..:). I just received "The E-mail" too and I PASSED!! Thanks to everyone who contributed to this blog and special thanks to Harwinder. You guys have been a great support group for me through this difficult process. Congrats to all passed and best of luck to all waiting for news or preparing for the exam. Congratulations to all who've passed. You are welcome. I'm glad to be of help, though I didn't do much. I can understand how difficult the last few days must have been for you. But now is the time to celebrate! Don't miss out on this opportunity. Take your family and friends out, and have a party! Thank you so much for your blog, tools and insights this has been very useful for my exam prep and understanding the scoring process. Keep up the good work and inspiring those who are working towards getting certified. I sat for my exam on 10/7/2011. I did not expect immediate results at the prometric center however when I saw the Congratulations message on the screen I was suprised to see it and relived at the same time. I have not received my email confirmation from PMI. The exam questions were very long. In my preparation I did numerous 4 hour practice tests and always completed these tests within 2-3 hours. The exam was long with very wordy questions and wordy answers. I finished my first pass on all 200 questions with 3hours 45 minutes on the clock. I had 15 minutes to review all marked which was not enough time. I unchecked all very fast to make sure I would end in the allotted time. I did not have time to review marked questions properly to validate my selected answers. Congratulations on passing the exam, and thanks for your comments. You are the second person to report that the exam questions were wordy, after the change. Maybe there's a shift in pattern there. The previous exam had only a few wordy questions. Thank Harwinder. All the best to you as well and please continue wih the good work and support you provide. Continuous process improvement is part of PMBOK Quality. Even the REPs are expected to show continuous improvement by taking feedback from students. Should not PMI practice what it preaches?? Based on past exam experience and feedback, should the PMI not improved the exam instead of repeating the problems! It'll be interesting to see whether PMI publishes a statement on the goof-up, and if they do, what they have to say about it. For most of us, failure is not an option! Also, after having put up so much effort and feeling confident on passing, if the result is incorrectly mentioned as FAIL, there is huge disappointment as well as mental pain. No matter the decision is overturned, still the pain we go through can never be compensated. So if they treat the handicapped this way, do you think the really care what anxiety or stress you suffered. What you and the others experienced seems to be "deja vu" of how PMI handled the last changeover..... They are using you as the "guinea pigs" to determine how "hard" the test is and they will adjust the passing grade accordingly. (The last time it started out at 70% and then PMI dropped it down to 62% (106/175) when not enough people were passing. I'm yet to take the exam and have scheduled to take it on 27th Oct. Hopefully, this will be sorted out by then. Unfortunately, whatever be the issues with PMI, this is what expected by the employers/clients here. So, have to do it. I passed PMP today! 3Ps, and 2MPs, it could have been all Ps if only i had food with me!! I finished in 2 and 1/2 hrs and after lost concentration due to hunger!! The quality of the PMP exam may have improved based on my experience. There were no errors in the questions/options - spelling or grammar. The sentences were properly worded, clear. Only some questions were difficult to understand especially for non-english based people. May be PMI is sincerely trying to improve the question system. Thanks Harwinder! I will need all the luck there is. I started my prep for PMP on Sep 13th because of security reasons as mentioned in Maslow's theory :). And I have to finish off the test ASAP. Oh well, I will know in a week's time! Any case, thanks for all your insights and your blog. You are doing an amazing work, kudos to you! I will come back and update you about my result after 17th. I just wanted to let you know that I cleared the exam.P,MP,P,P,MP. Thanks so much for all your help! Your blog has been my no.1 place to look for any concepts that I could not understand. The questions in the new pattern are tricky and also little more wordy than what I was expecting. I took PMP for the first time, so I do not know how the old pattern was. Any case, thanks again for all your support! Congratulations! That's a wonderful news. It seems like you indeed worked hard to achieve that level of proficiency! Thanks for your kind words. These days when I get such comments, I feel a bit guilty because I haven't been updating the blog as regularly as I want to. My entire focus is on BrainBOK. Anyway, I'm really glad to make some contribution in your success. The feedback I'm getting on the exam seems to indicate that the difficulty level of the exam has increased slightly, and the questions are more wordy now. When I took the exam in 2007, I don't remember getting a lot of wordy questions. Thanks again and keep in touch (my FB, TW and LinkedIn contacts are in the footer section). All the best for future. just passed my PMP exam on Monday with P, P, MP, MP, MP. I expected more tough questions but had numerous quite easy definition questions to answer instead. Greets from Germany and good luck to all exam candidates! I failed with result as follows. I'm sorry to hear that. I would say that you need to try a little harder to convert those two BPs to MPs or couple of MPs to Ps. Sometimes, you just need a little more luck to cross the line. Good luck for your next attempt. I am not a believer in "luck".... Hard work and better preparation is the underlying basis for much of what passes as "luck" in today's world. Ultimately, it all comes down to practice, practice, PRACTICE. I don't recommend the site, which you mentioned, to anyone. It's a commercially-driven, overly-moderated portal where you see the world through their lens. Any external link to good and helpful content, not feeding into their interests, gets blocked out. Apart from this, PM Zilla is a good alternative too. Until about a year ago, the Head First PMP Forum also used to feature on my list, but it has been dropped now. It's a shame that PMI-REPs and other PMP Training Providers have completely ruined it with spam. Many thanks, Harwinder for sharing your experiences and alternatives. Yes, I agree that the PM Hub has become overly commercialized, but then, isn't PMI as well? Like mother like daughter? I like the site because they are open enough to enable me to publish my rather critical perspectives of PMI and the PMP, and I also think the "lessons learned" are pretty appropriate. But I have another PMP Prep class starting in late January and I will refer them to the alternate sites you provided. I just did my PMP exam and I passed on my first attempt. It took me 3.5 hours to complete the exam. Good luck to all who are preparing for the exam! Thanks for sharing your results. I like your uncomplicated approach - read PMBOK and Rita’s book two times each. Please post your lessons learned on PM Hangout . I'm confused. First the early blog says that they don't issue immediate results anymore, that if you take the exam in Aug. you won't get your results until Oct., now this person says they got their results very quickly (March 2012). What's the current truth/policy? Nowadays the results are delivered instantly after you complete the exam. Hope that clears the confusion. Just took and passed the exam today (1st attempt). Same results as the previous poster (4 P's and 1 MP in M&C). Read PMBOK about a year ago. More recently, I used Rita's book (one pass through)/flash cards/sample tests. Got off to a bad start and was sure I was going to fail. I think I marked 12 of the first 20 for review. It just so happened that the most difficult questions (for me) were right up front. I ended up using the entire four hours. I would have like to have seen what I missed so that I could learn from my mistakes. I took the exam yesterday and failed miserably with Below Proficient in all the areas. I feel I was too tense and same time I was not good enough. I read only PMP book by Andy Crowe and I think that was mistake which I did. Most of the questions were on Risk, Quality and CPM. Please advise what approach should I take. I need to submit my application again as eligibility is at the verge of expiring. The biggest mistake was not basing your study on PMI's PMBOK Guide!! Andy Crowe, Kim Heldman, Rita Mulcahy- they are all SUPPLEMENTS to reading over the incredibly boring PMBOK Guide and UNDERSTANDING it. no known passing score, no idea what the pass/fail rate is, no firm information on how scoring works. It's sadistic. It increasingly seems like a scam. Anonymous, while I am in full and total agreement with you that the PMP is more scam than substance, I can tell you the scoring model uses (or at least previously used) the Modified Angoff method, and if you read my previous postings above, you can will see that for many years, the passing score was 106/175 or 62%. Based on 20 years of gathering data based on my benchmark exams vs the scores received on the PMP Exam when PMI used to publish that data, you can download an excel template which will convert your qualitative results from PMI to a numeric grade. This has proven to be accurate +/-3%. http://www.build-project-management-competency.com/download-page/ 11th bullet point up from the bottom. Hope this helps you some? Hello. I passed tonight with 1 Proficient (I), 2 Moderate (P and M&C) and 2 Below (E and C). I have been searching the web (and appreciated you myth bust) to make sure that it was not a false positive due to the 2 Below Proficient (as I found some articles about false Fails from last year). Can you verify that the pasiing score for 2013 is still about 62% percent and nothing has changed dramatically? Based on the feedback from some of our clients who have passed in the last 6 months, it APPEARS as though PMP has not changed the passing score appreciably. It appears to still be 106/175 or ~62%. Our analysis (based on the PMP Exam results from our clients benchmarked against their scores on my own benchmark exams) is accurate to +/-3%. So there is no weighting measure? Its is just correct vs incorrect questions measure right? 62% more or less. The weighting system will play a role only if someone is near that percentage. Am I geting it? I don't how bad I did on the two Below to fail. Taking the exam again this Saturday - Feb 16th, 2013. As the weighting for the 5 domains is not equal, the fact you were below proficient in the two most heavily weighted components is why you failed. For those interested in the relative ranking of all the major global project management credentials, I have just published an update. This is an independent and unbiased study, benchmarking the credentialing process ("earned hours") of all the major project management credentials against the US Professional Engineer (PE) license and Malcolm Gladwell's "10,000 hour" rule. You are the epitome of a cranky, old school, pessimist, academic and you fully believe that you are STILL (if you ever indeed were) at the very cutting edge of your field/career, despite your advanced age & declining perspective or paradigm on the business world.....as per your consistently negative posts on this board. I'm finally seeing & contribing to this blog in early 2013, as I've just been in the PMP world for a couple of years now and I'm glad I found it this discussion. My comments are geared towards the YOUNG, N.American PM's and aspiring PMP's,(whom I believe you are wrongfully and purposefully, misguiding for your own agenda), in regards to the decreased value you place on the PMP as a respected, recognized, value-added, business credential. Your repetivitive propaganda only hurts people's careers/aspirations/lives/livelyhoods which are temporarily strangled by the current OCR-word search resume tools, held firmly in the hands of the robotic HR recruiters & recruitng engines of our corporate culture; that will ONLY CONSIDER YOU for a decent project/program manager job, unless you have that magic "PMP" by your name, at the very minimum. Does having a PMP by your name make you a genius or a project management YODA......probably not. But it won't hurt either. Organizations are placing monetary & human capital VALUE on: Educated, experienced, well rounded, business professionals who can collaborate with or lead others, to work well in a functional/matrix/departmentalized/government environment; while keeping their focus at all times and producing consistent outputs.......PMP's!!!!!!!! The PMI, PMBOK GUIDE, PMI-PMBOK based Master's programs & the values/lessons learned in the PMP accreditation itself...SURE DON'T HURT EITHER, fella!! I'm a fan of PMI & the PMP credential; Because I KNOW it adds career value and opens doors that would be closed to professionals if they DIDN'T have the PMP; Not because of any other reason that that. Plus, the PMP enourages Ethics & Social/Professional Responsibiity, while encouraging process & performance development for the good of the individual and the hiring organization. Now.......what on earth is wrong with that???? For someone with such strong opinions, it seems strange that you would be unwilling to use your real name? I realize my "opinons" (which at very least I try to back up with solid research), may not be popular, but at least I have the professional integrity to stand behind what I write and am willing to sign my name. Having said that, I am NOT an academic. I am a life long project management practitioner, constructing buildings and investing in property, where my own money is on the line if the projects "succeed" or "fail". Are you familiar with the story about the "Emperor's New Clothes?" Well, contrary to popular opinion, I am willing to stand up and tell you that what PMI is "selling" you is a false promise- that the PMP is nothing more than an entry level credential, validating little more than those who pass it know PMI's vocabulary. It does NOT mean you are able to put what you know to work nor does passing the PMP validate that you actually DO put what you know to work. Did you read over my latest research? http://pmworldjournal.net/article/project-management-credentials-compared-an-update/ Actually, PMI's PgMP scored quite favorably..... But NOT the PMP nor any of the other PMI family of credentials. In all seriousness, if there is ANYTHING I have written you disagree with, then I can only encourage you to publish a properly researched, peer reviewed paper which refutes any of my claims or advice. Understand, I am not interested in unsubstantiated opinions or marketing hype published by PMI, but legitimate, fact based research. Iam trying for PMP exam many times , I read the books serveral time within 4 yrs , I took the preparation course on June-2009 and I know it as I know my name!! !, what it suprised me I failed Three times , Even Iam honor student , Mechanical Engineer with MBA from reptutable University , I saw kid and teenagers from my local countries they passed the exam and I asked them about the tools and techinques and they told me we are parctising only simulations exam on the net with high prices, and we went for exam to pass , I shocked by answer , on april , I spend 100 Days reading the book and I paid 60 USD to PMPerfect which is more diffcult to PMP exam , I used to get 78%-82% on all mocks , I completed exactly 1400 Question, (400 from rita seventh Edition study guide and 1000 questions from perfect PMP, I marked the question which around 37 Questions on the exam which iam not sure about , I have felt I passing the exam on the question number 155, I fialed 4 MP ,except one BP on excuation , I read the book for almost 4 years from the beggining, it was in 13-April-2013 , Then I change the pomteric to different country , which close to our country and U got the second trail test aftet 3 weeks , it was on 9-May-2013 , I marked all the questions I have doubt on them ,they were 50 , !50 Question sure as my name , and the questions are same the prevoius Exam (same ) so I finished the exam before 30 minutes of the exam ending time then I went for review and I did two best answer on 50 ,I think I got 30 on them the reason behind I lost the eagrness to pass and I lose confidence on PMI, I tries to appealed the first exam to PMI and no proper answer and I challenged them , but it seemed to me they are commercial and They are creating popoganda , I will not turst PMI any more. Since all the measures I did , I will try something else like CCE with AACEI, I like Economics and schedules development, Math as general , since I was A sudent in Maths and Claculations of EVM, NPV,FPV, which more repected than funny PMP, since my co-workers with PMP certified they do'nt know the basic of handling Projects like I do ,Please send me your queries to my email : nadeem_aldeem@hotmail.com. Thank you Dr PDG for your informations since I did analysis and seemed to me I got more than 70% on the exam , and I could not clear it , it is really funny PMI. Hi, I passeed today! Mod.Preficient. Rita was all I studied! I was suprised in the exam with the ammount of EAC/ETC/BAC/TCPI/SV/CV questions! I bought the Rita Exam Prep (1500 odd questions prep), which were great but not enough to satisfy some of the CV and SV questions (where CV had to be worked out by SV and vice versa). I passed yesterday with 5 Ps. My 2 cents - understand each concept and relate to any big project. No need to memorise. PMI hat is important to think like them. Maths - easy, think around 30 Qs on EVA itself. All said and done, i was scoring only 70-75% in all the mock exams and was surprised with 5 Ps. Read only Rita and PMBOK, referred to Kim only for Probability distribution. Checked on net for motivational theories which were not there in rita and a few other topics for better understanding (tornado diagram, sensitivity analysis, monte carlo etc). In June 2013, I became PMP certified with "Proficient" grade across all the five process groups. I just studied PMBOK guide and Rita's book twice. Prepared for 1.5 months. I just had about 5 questions which I was not very sure of. Hello, I passed the PMP test this week (Nov 2013). The first 20 or so questions were tough but the test got easier after that. I read Rita's book three times and most of the PMBOK once. I took many pre tests from http://exam.pm-exam-simulator.com/ . I scored BP in the “I”, MP in the “Closing”, and P for the rest. I took the exam today and failed. My results were as follows: BP (I, M&C), MP (P,E,C). I have spent the past 1 ½ months studying on average 15 to 20 hrs per week. This consisted of reading the PMBOK (all of it), reading Rita's book (doing all of the tests at the end of each chapter), taking at least 12 to 15 exams on Rita's test simulator CD. Re-reviewing questions I got wrong and looking up the answers to instill the concept. I have been a successful practicing PM professional for 15 years working for companies such as IBM, Sprint and currently one of the worlds largest software development company (no, not Microsoft). I have a B.S. in Computer Science, an MBA and two other certifications. I am quite disappointed and plan to sit for the exam in the next 2 to 3 weeks as my application expires at the end of January. I completely agree with Dr. PDG's feelings about the PMP certification process. It is an outright scam! The ONLY reason I am going to get those stupid initials is because it has become almost a necessity to remain competitive in the market place (at least in the U.S.). More and more job descriptions list “PMP preferred”. This simply means that if they have PMP candidates to choose from with any resemblance of qualifications, they are likely to get the interview over you. I personally find that insulting that companies/ hiring managers have become so ignorant and bought into the whole propaganda of PMI that they would fall for something so stupid. Obviously I have been able to remain employed in my field, but it is getting more difficult and I have lost out on interviews simply for NOT having the PMP. I will tell you that when I hire other PM's, I do not care less whether they have their PMP. Fortunately, I have control over this and am not mandated to hire individuals simply based on credentials that do not tell me whether someone is qualified to do the job. Companies/ hiring managers have become too lazy to take the time to properly interview. And, perhaps maybe its to ease the jobs of HR recruiting so they can simply search for buzz words to know if the resumes should be passed along. This world is continuing to be dumbed down in all aspects. And, while I can't speak to previous versions of the PMP test about being dumbed down. I will be those who say it has happened. That said, I do not believe that makes me any less of a PM simply because I can't regurgitate the terminology in the manner PMI wants such that I can obtain a passing score. I have always been a very analytical and logical thinker and perhaps I can over analyze, but I will ALWAYS make the most informed decision possible based on all information I can uncover. The idea of answering questions based on what is the “best” answer with 2 or 3 sentences is ludicrous. I could easily prove in many scenarios where the answer PMI says their answer is correct is simply NOT TRUE and would be detrimental to the business in choosing that course (at least based on the information they provide). As I said, I will sit for the exam again simply to gain those three stupid initials. I wish more people would post their results since the Version 5 exam came out. I am curious at the post on February 13 @ 10:30am, from “Anonymous” who posted 3 MP's and 2 BP's (M&C,C). I realize that was the Version4 exam, but since my BPs were in I & M&C, I am surprised that he/she passed and I failed- assuming that poster is accurate about their results (but then why come on here and post this if its not). Additionally comparing that person's results and mine, I thought after reading this blog that I is not as heavily weighted as M&C and C. This has me scratching my head. I did talk to a peer this evening who took the exam a month ago (Version 5) and he received 4 MP and 1BP. I did not ask him which category was the BP, but will be doing that tomorrow. Other than continuing to study and pay particular interest on the BP areas, I am not sure what else there is to do. I will NEVER be a PMI foot soldier and if anything, whenever I have the ability to combat this ridiculous mindset in the professional world without jeopardizing my job, I will be doing so! Dr. PDG, do you have an updated template for the Version 5 exam? I'm really sorry to hear about your result. I can understand your situation to some extent. There are many issues around PMP certification, which are being discussed in various forums, and you've touched upon one of those. Hopefully PMI would take notice and address them. Obviously the exam result does not undermine your experience and skills as a project manager. The PMP exam, as you observed, mostly tests your ability to answer the questions in a specific way, and your ability to recall the ITTOs laid out in the PMBOK Guide. As far as your result is concerned, I have started to believe that it's still the overall percentage that matters. Your proficiency in individual domains is of little significance to your overall result. Had you scored P in one or more domains, you could have still passed. I wish you good luck for your next attempt. As I said in the previous comments, it still seems that the overall score matters, and not the domain-wise proficiency. KC_Gal, as Harwinder noted, there are many discussions on the various Linked In forums about the waning credibility of the PMP and all I can tell you is there are other certifications which are not as well known but are certainly MUCH better than the PMI family of credentials. Next week,PMWorld Journal will be publishing my 2014 update to my benchmarking of the various credentials and in the coming update, I have added the ITIL, IIBA and GPM Masters credentials. Harwinder, thanks for the comments. I am curious, you said I touched on one of the issues being discussed in other forums. Can you tell me which issue you are referring to? Dr. PDG, I appreciate your suggestions, but the certifications you mentioned are not in demand and as I mentioned the job descriptions are stating the preferred PMP certification- so that is what I plan to do simply for the future stability of my marketability and for that reason only. Also, I do not want calls to be a BA. I have been in management positions for many years now and because the HR recruiting process has become one of simply searching for buzz words, I have to keep that understanding in the forefront with what certifications I choose. I hope that your publication will be available online, would be very interested to read it. Just one other thought. I have a friend with similar background as myself and is currently looking for work and finding the same experiences with losing out on interviews simply because he does not have the PMP. He has a B.S. in Computer Science and a Masters in Project Management. Understood KC....... I guess as long as people are unwilling to push back and explain to the HR folks that the certifications they have are actually BETTER than the PMP, this entry level credential will continue to be used as a defacto license to practice. Here is the link to the 2012 update Project Management Credentials Compared and the 2014 update should be out in the next 24 to 48 hours on the same PM World Journal. Bottom line- I am doing all I can to tell the truth not only about the PMI credentials, but ALL of them and I can only hope that enough people will read them and start to push back, not only to HR departments but also to organizations such as PMI who are making patently false and misleading claims about their credentials. If you want a sneak preview, go HERE http://www.build-project-management-competency.com/download-page/ and download line items #27 and #28. I was referring to the issue of the exam format being tricky (somewhat of a gamble). Many experienced and skilled project managers are not able to pass despite putting in a lot of effort. On the other hand, hordes of unqualified and inexperienced (in project management) people are getting certified every day. Ok, thanks. My take on those who have little experience and not really qualified to do true PM work who seem to sail through the PMP process is probably because its easier to drink the kool aid when you don't really know how things really work in the REAL world. For those with the experience easily passing, I don't know. There are some people like myself who are probably on the extreme of having a very analytical and detail oriented (maybe to a fault) that know that PM work is simply not black and white. It never has been and never will be. As a PM, you must be capable of taking the big picture in respect to the end goal to figure out what your NEXT step should be and sometimes it means going COMPLETELY against traditional PM ways of doing things whether it be because of the culture of the organization or simply limitations imposed that are out of your control. Thank you for making the link clickable. I'm sure its a limitation of the blogging software but I have noticed that when people post links that you can't even highlight them. Going to read up on that now. I agree Dr. PDG about the need to push back and while I will continue to do what I am able within the power I have within the organizations I work for, and speak out where I can to voice my concerns- by me choosing not to get a PMP will not change whether HR recruiting and companies using that as a precursor to get in the door would preclude me from even being able to tell said persons that the "other guy/ gal" they brought in instead of me may or may not be as qualified just because they had those 3 special initials. Harwinder, what you describe is an indication that what the exam is testing for is not in alignment with current "best tested and proven" practices either that, or there are a lot of companies out there which are doing things which are at odds to what PMI is advocating. Which is why we need to move to a COMPETENCY based assessment approach. Why? Because a competency based assessment is NOT prescriptive. It does NOT require that you do something a certain way, using a certain formula or a certain terminology. In a competency based assessment all we look at are the OUTCOMES. Did the project finish on time? If not, why not? Did the project finish within budget? If not, why not? HOW the project manager achieved the desired outcomes or mitigated adverse outcomes or risks is not important. While I used cost estimators as the example, the same approach applies to project managers as well. KC, understand your need to find work forces you to get the PMP, so your next best option would be to go to the Linked In discussion forum and you have an audience approaching 500,000 people in which you can make your valid opinion heard. As for being "detail oriented" according to my research, that is one of the behavioral attributes which is consistent with "successful" project managers- http://pmworldjournal.net/wp-content/uploads/2012/08/PMWJ1-Aug2012-SecondEdition-GIAMMALVO-UsingBehavioralProfiling.pdf successful project managers tend to be detail oriented. Why? Because projects succeed of fail because of details. Project SPONSORS are the people who need to have the big picture. Project managers need to sweat the details. Thought I would share that I called PMI today to confirm my date of the application expiring. It indeed is 1/27/14. I was able to get a 3 month extension. I'm certain I only got the extension because I had already taken the exam once and was 3 weeks away from expiring. I wanted to share some things about my conversation with this individual today about the scoring model. Maybe some of this will surprise some, maybe not. I learned that it is possible for 2 people to get the same level of proficiencies and one person can fail and another can pass. This has to do with how they fell within those ranges. So, if the person who failed was at the bottom of enough of the weighted questions, that will mean they will not pass (in comparison). I don't plan to use the full extension, and hope to take it early or mid February. I am taking a week to just clear my head as I have been studying solid for 6 weeks solid. Enjoy and hope this will help people in making the decision which credential(s) are best for them, given their career path objectives and interests. How much it matters to pass PMP when you don't have experience of projects in practical life properly? English is not my native language, to how much it will effect my scores ? and how to cover this problem ? Moderately Proficient for Executing, M&C and Closing. I could use some help or advise from someone who had done it after July 2013 as I understand it is based on PMBOK 5th edition. No spam/advertising or junk mail please, I really don't need them, I just failed an exam. Today I attemp PMP and failed!!!!!! 1- First 1-10 question make me nurves and its continue till 50..
4- Got panic in first hour because I was not doing well. I got 3BP and 2MP but still passed. But I the 2 MPs I got are for the 2 biggest knowledge areas - Executing and Monitoring/Control. So it is possible to pass even with 3BPs. Thanks for sharing your experience :) Every comment counts. I failed the PMP exam today with 2BP (initiation and m&c) and 3MP (planning, executing and closing). I observed that nobody passed the exam without getting atleast a MP in M&C and Executing domains. I did very much enjoyed this article and what people said about people getting a pmp just because it will land them a better job, which is very true. I dont think that PMP makes a project manager better or worse and I think people should stop putting so much emphasis on it. I actually took this exam for the Fourth time today and Failed. I had been studying on and off for about 2 years. My piece of advise is to try your best and if you dont pass dont worry. One exam does'nt make you more or less better than others haha. After all many pmp's dont have a job here in the usa and are unemployed as well. Good luck to everyone. 4 attempts! Amazing story of perseverance. May I ask what keeps you going for it? I would say that PMP doesn't necessarily make one a good project manager but it may help to get better. And it may also help to get a foot in the door when it comes to job interviews. But I agree that failing an exam is not the end of the world. I know some really good project managers out there who do not hold any certification in project management, and some software developers who have never managed even a small project and flaunt a PMP certificate on their cubicle wall. I passed the exam on November 2016. I received below proficient(initiation), moderately proficient(planning), moderately proficient(execution), below proficient(controlling) ,proficient(closing). I read two books twice, and took a lot of prep questions. Also, my company paid for a prep course, but I believe is not necessary to pass the exam. Congratulations! Thanks for sharing your result. Interesting indeed. Here 2 additional data points... I passed March 2016 with P-Initiation + Closing and MP-in the rest of the areas. Studied for 30 days with PMBOK and Rita's Book. My spouse passed in 2012 with MP- 3 areas and BP- in 2 areas. The exam was easier than expected probably would have scored higher if I didn't go back and second guess myself. The PMP only tests that you understand the PMI framework. People must have experience running projects to be a successful PM. Personally, obtaining my PMP is just the start of continued learning. Thank you for continuing the conversation. Congratulations for passing the exam, and thanks for your contribution. Each new data point enriches this post and provides more insight to the PMP aspirants. So i took the CAPM exam and i had 6 BP and 5 MP but most of my BP has higher percentage than the MP but failed. I took this exam over a year ago and this has really affected my confident level. Do anyone know what i did wrong, what i should focus on or whatever advice anyone could give would be helpful. Below is the result. Thanks guys. That's unfortunate. You could be well below BP and barely above MP in some domains and may have missed the passing mark by a few points. I'm not too sure how well you prepared, but if make yourself thoroughly familiar with the PMBOK Guide, you should be able to pass the exam in the next attempt. And a bit of self-promotion here - read some blog posts on this blog to clear your basics (look for the label "Study Notes"). You can also try BrainBOK if you want to make your path easy. Awesome, thanks for the advice. I studied for about two months but i realized more than half of the entire questions was based off ITTO which happen to be my weak area. Any advice what i can do to familiarize myself with it or memorize. Thanks again for the advice, i will look into your suggestions. BrainBOK is the best tool to master ITTO. It has the ITTO Explorer, ITTO Quiz, ITTO Flaschards, and the CAPM practice exams have special focus on ITTO. Start with the free version and see whether you like it. I had only 3 weeks to prepare because of my busy schedule and the fact that I have to prepare to other university admission tests such GMAT and Ielts. I was given the impression that you should study Rita and other PM books but I didn’t have time so I only studied the PMBOK and I did one PMstudy simulator before I start studying to focus on my weakness. I passed the pmp test in July 2018 with AT in initiating and planning, Needs improvement in Executing and BT in both Mentoring/Controlling and Closing. The overall performance was Target. the exam was mostly situational questions and a few indirect ITTOS related questions. I think that Project Planning questions have a higher scoring weight than the other domains. When I checked the exam analysis on my profile, I got high in most Planning tasks. Congratulations, and thanks for sharing your experience. Every comment adds value to the post and helps those aspiring to get certified.